If you are visiting Italy this summer, you will probably want to try authentic Italian pizza. Having pizza in the land which gave the world this wonderful circle of joy is an experience not to be missed. On your Italy trip you may be heading for the fabulously beautiful Italian city of Florence. If you are, you will probably want to know which pizza places you should head for. 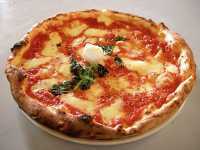 Which are the best pizza restaurants in Florence? If you want to know, this list is for you. After the TripAdvisor list, as a bonus you’ll find insider Florence pizza restaurant tips from Italy Chronicles’ contributor Stephen Lusher who lives nearby. 1. The best sit down pizza restaurant in Florence is: I’ Pizzacchiere – “One of the best pizzas in Italy, definitely best prices”- said a happy fan. 2. Pizza Man Viale De Amicis – “Most unique pizza experience!” and “Best Pizza I Have Had In 15 Years”. 3. Pizzeria Toto – “Great pizza!”. 4. La Bussola – “Terrific pizza”, “Deserving of the accolades!”. 5. Ciro and Sons – “BEST Gluten Free Pizza Ever!!”. 6. La Divina Pizza – “Amazing Pizza, Great Place”. 7. Mr. Pizza – A“Great choice for a Pizza” which is “Good value for money” too. 8. Mangia Pizza Firenze – Takeout pizza – “The Perfect Crust”. 9. Focaccine Bondi – “Wow!”, commented one happy customer. “Great food, old school service”, said another. 10. Il Giardino di Barbano – “Great pizza and service”. 1. Pizzaiuolo in the San Ambrogio district – excellent pizzas. This pizza restaurant also comes highly recommended by Florence resident Nardia Plumridge of Lost in Florence. 2. The groovy and fun Yellow Bar on Proconsolo between the Duomo and the Bargello is hard to beat. 3. The upmarket Obika – a mozzarella bar which specialises in pizza featuring the mouth watering Campania mozzarella. There you go, a list of the pizza places in Florence for you to try. Come back and let us know which one was your favorite! Don’t miss the best pizza places in Rome if you are heading to the Eternal City. Thanks for this. Great article and list. About uniqueness, try to check this article http://www.exploretalent.com/articles/top-10-heavenly-pizza-creations/ . It shows some unique pizzas. What do you think about it? Alex, You should always consult an expert when it comes to things like pizza. TripAdvisor can be overtaken by travelling Americans with strange tastes. Think Pizza Hut, Domino’s etc. I have to tell you the best pizza in Florence is to be found at Pizzaiuolo in the san Ambrogio district. Wood fired and the clearly best with daylight a distant second. If you need an alternative, Yellow Bar on Proconsolo between the Duomo and the Bargello is hard to beat. Also wood fired, groovy and fun. Moving upmarket for a moment – in an architect designed space in a grand palazzo on via Tornabuoni is the recently opened Obika. It describes itself as a mozzarella bar but specialises in pizza featuring the mouth watering delicacy from Campania. Obika is in the mould of Eatily – smart, great design and fabulous choices. Hint: Obika sells its amazing pizza and salads in Milan – at the Duomo and at Brera. Thanks Stephen – I’ll add those as insider recommendations which are, as we both know, generally the best.